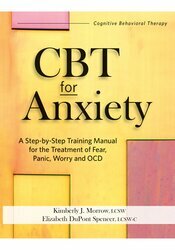 Combining evidence-based approaches and years of clinical experience, CBT for Anxiety provides step-by-step skills training for implementing cognitive behavioral therapy into your anxiety treatment plans. Concise, clear and practical, this workbook will provide immediate tools to motivate, encourage and effectively treat even your most anxious clients. A key highlight of the book are guided opportunities to work through treatment obstacles to enhance your clinical skills. The authors have also created dozens of reproducible worksheets, exercises and handouts to share with clients and their families. Kimberly Morrow, LCSW, is a licensed clinical social worker in private practice in Erie, Pennsylvania, and has been specializing in treating people with anxiety and OCD for over 25 years. She is the author of Face It and Feel It: 10 Simple (but Not Easy) Ways to Live Well with Anxiety. Elizabeth DuPont Spencer, LCSW-C, is a licensed clinical social worker and board approved supervisor. Trained as a cognitive behavioral therapist using exposure and response prevention for anxiety disorders, obsessive compulsive disorder, and depression, she has been in private practice for 25 years. She is the co-author of two books, The Anxiety Cure and The Anxiety Cure for Kids.